Else Hamayan is a psychologist, language education consultant, and former director of the Illinois Resource Center in Arlington Heights. She advises teachers and administrators nationally and internationally on issues of second language learning, special education, culture learning, biliteracy, and dual language instruction. She is co-editor of English Language Learners at School: A Guide for Administrators (with Rebecca Field). 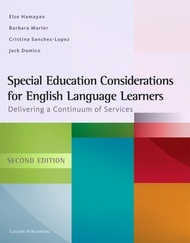 She is also co-author of Special Education Considerations for English Language Learners: Delivering a Continuum of Services (with Marler, Sánchez-López, and Damico), Dual Language Instruction from A to Z (with Nancy Cloud and Fred Genesee), and CLIL in Context: Practical Guidance for Educators (with Fred Genesee). Barbara Marler has more than 30 years of experience in bilingual/ESL education. She has taught students in both ESL and bilingual programs in grades K-8, served as a Title VII preschool director, and directed the bilingual/ESL and foreign language programs in a large suburban school district in Illinois. She is certified in both ESL and special education and has a master’s degree in administration and supervision from National Louis University. Since coming to the Illinois Resource Center (IRC) in Arlington Heights, she has served as the primary consultant for the Illinois State Board of Education in the area of Newcomers’ Centers, coordinated Project READ WELL (a Title III professional development program for mainstream teachers working with English language learners in northeastern Illinois), and mentored a cadre of adjunct instructors teaching the graduate course, Assessment of Language Minority Students. Marler also coauthored Special Education Considerations for English Language Learners: Delivering a Continuum of Services, was retained as an expert in ELL matters by the U.S. Dept. of Justice, and served as the lead developer of the Perfect Match staff development series (a joint IRC and World-Class Instructional Design and Assessment [WIDA] endeavor) focused on research/evidence-based ELL program design. Her focus and interests are program design/management, systemwide reform/restructuring, assessment/evaluation, Title III programming, partnering with community agencies, response to intervention (RtI) and special education for language minority students, effective instructional strategies, and school efforts to reduce cultural conflict. Cristina Sánchez-López is an education specialist at the Illinois Resource Center (IRC) in Arlington Heights. She collaborates with educators in the United States and Canada on English language learners (ELLs) and special education, middle school mathematics, literacy across the content areas, multilingual education, engaging parents, and supporting preK educators who serve ELLs. Prior to coming to the IRC, she taught at the elementary, middle school, and university levels in the United States and Mexico. Sánchez-López teaches graduate courses in the areas of ELL reading and the foundations of language minority education. She has been working extensively with her colleague, Theresa Young (SLP), in collaborating with school problem-solving teams as they support ELLs. Sánchez-López is coauthor of Special Education Considerations for English Language Learners: Delivering a Continuum of Services. She coauthored (along with Barbara Marler) the Illinois Special Education Eligibility and Entitlement within an RtI Framework: A Guidance Document. She also authored the WIDA Guide to Developing Culturally and Linguistically Reponsive Response to Instruction and Intervention (RtI2) for English Language Learners, as well as various articles and chapters on addressing the needs of ELLs. She and her husband have raised their daughter bilingually.